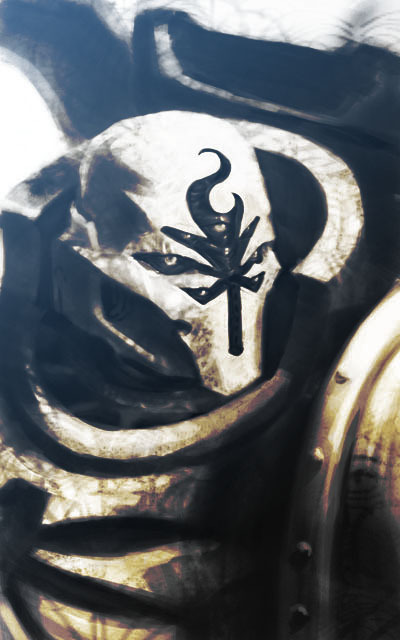 Welcome back to the most recent post in the Lost and the Damned tactica series I am doing here. Yes, I know it has been a long time, but we are almost at the end now. Tzeentch in EPIC is the daemon that deals mostly with firepower, whether in the form of actual shooting or good firefight scores – often with the bonus of decent AT scores and / or Ignore Cover. 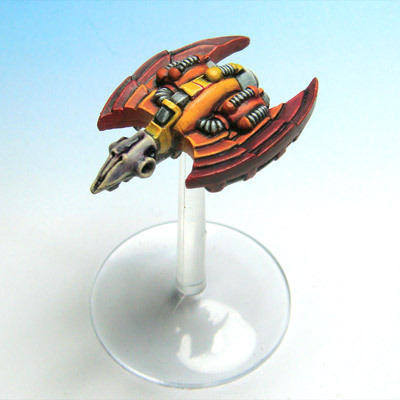 This makes them particularly useful in the Lost and the Damned which tends to lack in decent quality firepower – see my previous article here on Daemons for more of an explanation. 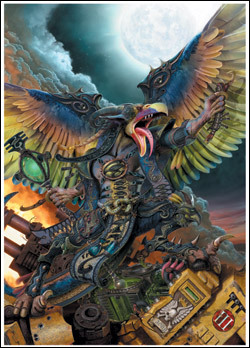 Tzeentch Daemon engines are particularly unique because they are the only one that are flyers – either proper flyers or skimmers. 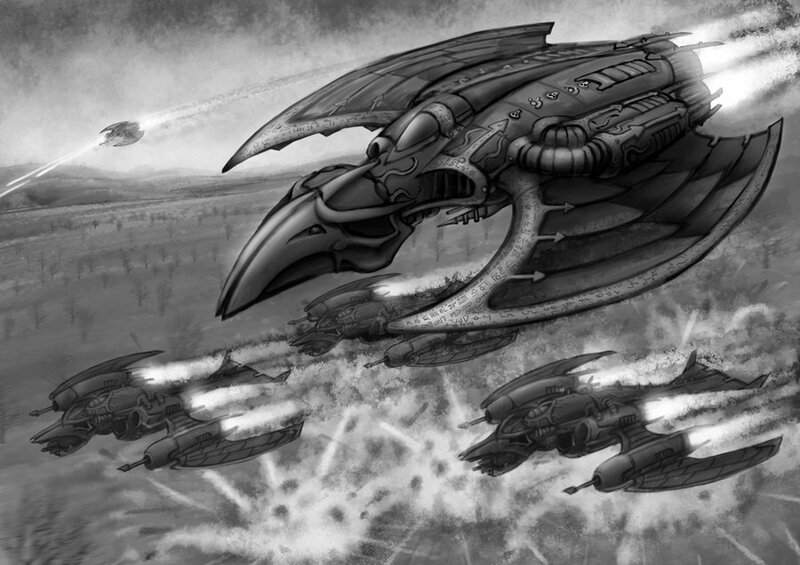 Both the Doomwing and the Firelord are flyers, adding to the LatD Thunderbolts and Marauders covered here, while the Silver Towers are skimmers which mount long-range anti-tank firepower. Doomwings: Doomwings come in formations of three at 150pts, with each Doomwing being a 6+ Armour Save (and Invulnerable Save) fighter armed with a Flame Cannon – an AP4+/AT5+/AA5+, Ignore Cover, Fixed Forward weapon. This makes them surprisingly good at anti-infantry work, with the AP4+ and the Ignore Cover syncing up well to target infantry formations hiding in cover. The AT5+ is decent, but nothing special, and I not quite sure how a flame-thrower works as an AA weapon. The main let down for the Doomwing is the 15cm range on the weapon – this means that in order to shoot it has to get exceptionally close to the target. This means that the Doomwings will be exceptionally vulnerable to both active and passive AA, which, given they only have a 6+/6+ save, makes them very fragile. Firelord: The Firelord is the bomber version of the Doomwing, being a 4+ save, Bomber type. It comes as a formation of 1 to 3, at 150pts each. This makes them pretty flexible. Each Firelord is armed with a Flame Cannon (15cm AP4+/AT5+/AA5+, Ignore Cover, FxF), Firestorm Bombs (15cm D3BP, Ignore Cover, FxF), and a Twin Lascannon (45cm AT4+/AA4+, FxF). This makes them pretty good as an anti-infantry bomber – throwing out between 1-3 BP plus the AP4+ from the Flame Cannon. The Lascannon does not really turn it into a viable AT attacker, but it does provide a little long range AA into the mix. Being able to change the formation size is a real bonus – pick one to fill in 150 spare points, or go balls-to-the-wall with a 450pt formation of three. That is 3D3 BP (average of 6) plus three Ap4+ Ignore cover shots, plus the three lascannons! 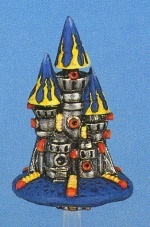 Silver Towers: Silver Towers are the only non-flyer Tzeentch Daemon engine – a 20cm skimmer, with a 4+ Armour Save, 6+ close combat, and 4+ firefight. They come in a formation of four and are armed with two weapons – Arcane Cannons (45cm 3x AP4+/AT4+) and aBeam of Power (60cm MW5+). These are significantly different to any other firepower available to the Lost and the Damned list – long ranged, reliable, Macro Weapon. A full formation of four can kick out a huge amount of firepower, but they remain very fragile – best kept back, preferably behind cover, using Skimmer to pop up and fire. In the context of the wider list, the Tzeentch Daemon Engines as a whole do not really fill a role that cannot be adequately filled elsewhere – Doomwings are generally worse than their Thunderbolt equivalents for the things I want my aircraft to do, while I feel Firelords lose out to the possibilities offered by artillery of the more conventional kind, even though they do have Ignore Cover on their bombs. Silver Towers I think offer the greatest benefit tot he Lost and the Damned army as they provide some decently fast, hard hitting firepower that can threaten armoured vehicles effectively from far enough away to remain safe.